Osmosis with Pump and filters 10"
The Super Active Mineral Carbon Aquili is a granular carbon of high quality, produced from a selected raw material of mineral origin, by physical activation (steam). This carbon is particularly effective for the removal of organic pollutants, dyes, pesticides, chlorinated solvents, aromatic hydrocarbons, phenols, tannins, chlorine, chloramines, ozone and compounds that cause bad odors and taste in the water. 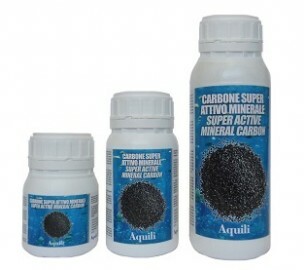 Super Active Mineral Carbon Aquili complies with the standard UNI EN ISO 12915 "Granular Activated Carbon for use in the treatment of water intended for human consumption". Active Carbon is easy and convenient to use because packaged in a special perforated material that allows a more simple than ever utilisation, without dirtying hands. Active Carbon is available in sizes: 3 pre-measured bags of 120 grams each and in one single bag of 300 grams, suitable for big aquariums. open the capsule and pour the powder on the product into the filtering sock. Bacterium E Plus will increase its effectiveness by metabolizing the blocked pollutants and making the product more effective for longer. 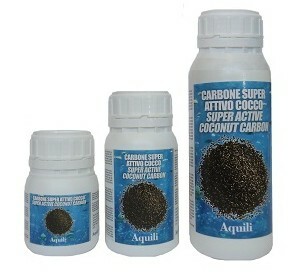 The Super Active Coconut Carbon is a granular carbon of high quality, produced from coconut, by physical activation (steam). The concentration of decaying organic substances in an aquarium is very high in relation to the amount of water, for this reason we need a very active bacterial culture that metabolize quickly all pollutants. The bacteria need a specific substrate to installed in the aquarium filter; this substrate must be as large as possible and suitable to bacteria needs. The most suitable products are the Sintered Glass Ring. 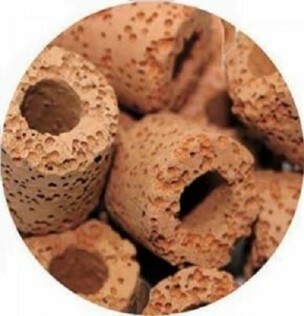 The sintered glass rings, thanks to their cylindrical hollow and extraordinary porosity, are filter materials with multiple properties, suitable for both mechanical and biological filtration. • The particular cylindrical form do not hinder the passage of water and promotes the deposition of waste materials that remain in the filter. • The special treatment of their raw material (the glass is broken up and recast), gives them a unique porosity given by innumerable pores communicating with each other. 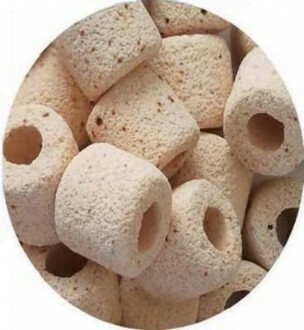 • The special structure of holes, together with a suitable wall thickness, offers the ideal conditions for nitrifying bacteria. This ensures the best decomposition of pollutants Ammonium and Nitrite and, with a decreased flow rate of the Nitrate too. • Each glass ring has a surface area of 1 square meter and 1 liter of product offers an area of almost 300 m2, exploitable for colonization of nitrifying bacteria. •	This gives rise, with a smaller quantity of filter material, more effective and safer filtration (1 liter of product is sufficient for an aquarium of 200 liters). The material is completely non-toxic and reusable. 35 – 60 % of their structure is porous. 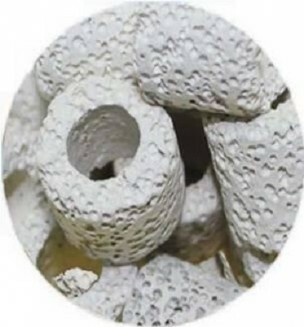 3 - 4 times more porous than sintered glass ring, more than 20 times more porous than ceramic ring. Their particular internal structure makes them perfect for bacteria installation.